In a medium saucepan, heat milk, sugar, lemongrass and basil over medium heat. Bring to boil, reduce the heat and continue to simmer, stirring occasionally, for another 10 minutes. Remove from heat, then add coconut milk into milk mixture. Mix until incorporated. Sprinkle gelatin over the cold water in a medium sized bowl, and let it sit for about 5 minutes. Using strainer, pour very hot Panna Cotta mixture over the gelatin (make sure that you get rid all of lemongrass and basil) and stir until the gelatin completely dissolved. Divide Panna Cotta into 8 serving bowls/cups, chill in the refrigerator until firm, at least 2 hours. To make compote: heat sugar, water and lime juice in a saucepan over medium heat, let it simmer until it thickens. Remove from heat and cool down. To serve, toss sliced kiwis into the sugar syrup and blend well. Spoon kiwi compote on to each Panna Cotta bowl. Wow, this sounds so, so tasty! 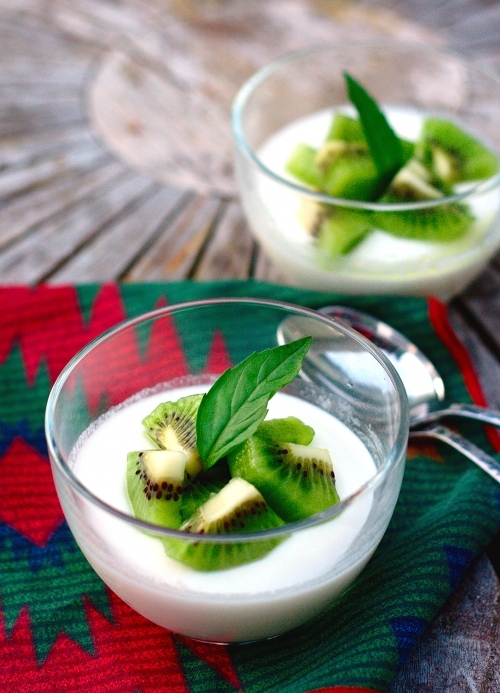 I love panna cotta, and since I've been on a huge coconut crave, this is just about perfect. Lemongrass and Kiwi sound like a wonderfully refreshing touch :) Bookmarked! Thanks, Kiri :) It's very easy to make, too. Those are beautiful! And the ingredients are definitely original and beach worthy! I agree with Kiri's comment, definitely a refreshing dish! Bravo! 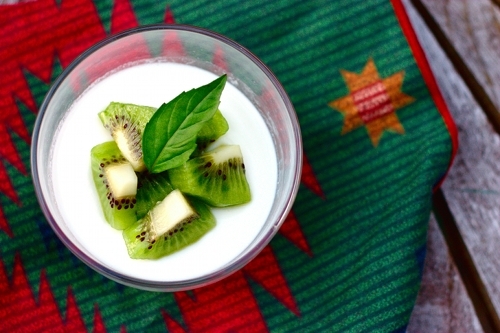 What a delicious variation of panna cotta!! It really sounds good! Wow what an awesome idea for panna cotta! Love it!